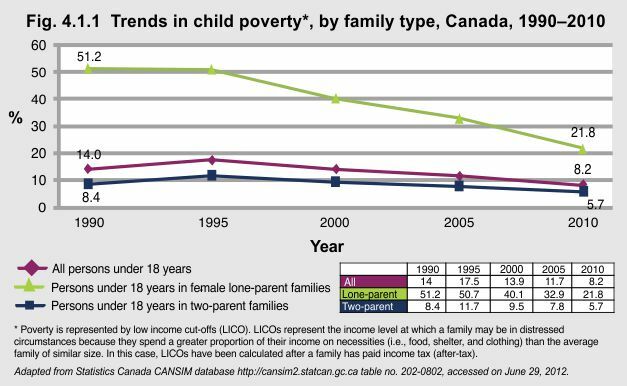 The number of children under 18 years living in poverty in Canada decreased to 550,000 (8.2%) in 2010 from 942,000 (14.0%) in 1990. For children under 18 years living in two-parent families, the number living in poverty decreased to 314,000 (5.7%) in 2010 from 475,000 (8.4%) in 1990. The most marked change was among children living in poverty in female lone-parent families. Their numbers decreased to 187,000 (21.8%) in 2010 from 407,000 (51.2%) in 1990. 1 “Campaign 2000: 2010 Report Card on Child and Family Poverty in Canada; 1989–2010.” Accessed on June 29, 2012 at http://www.campaign2000.ca/reportCards/national/2010EnglishC2000NationalReportCard.pdf .